Ahmedabad (Gujarat): A day after police detained a truck carrying 167 cows near Shyamlaji, city cops detained a truck in Saraspur carrying cows. Widespread trafficking of cows has raised concerns about disappearing of several important breeds of cows. 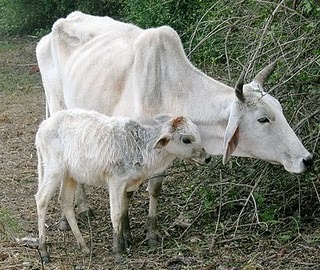 A Delhi-based trust has come up with a shocking claim.The illegal slaughter of cows has led to some 110 breeds of the animal going extinct in the country since Independence. According to figures provided by the Akhil Bharatiya Go-Sanvradhan, the country had some 118 breeds of cows till 1947. But now the trust says only 18 of them survive. The trust has blamed the large scale slaughter of the animal for the drop in number of breeds. "Prior to 1947, India had over 48 crore of cows. But now it is just 6 crore," said national president of the trust Swami Swayamanad Giri. He was speaking at a press meet on Thursday. These claims are supported by other organisations of the city working to prevent the illegal slaughter of cows in the city. Tejabhai Desai, a social worker said kidnap and slaughter of cows has seen a rise in and around the city. He said that for the last one year butchers have been active in villages surrounding the city. "On Monday, 8 cows in Shertha village of Kalol had gone missing. Similarly, Maaldhari boys spotted butchers trying to escape with 4 cows in Santej village," said Desai. He claimed that in the last few months more than 70 vehicles loaded with cows or beef have been detained in Dholka taluka alone. "This is the reason why cow population is going down. Government and police must do something to stop this illegal slaughter" said Desai. The picture is even gloomier in Ahmedabad city, as illegal trafficking and slaughtering of cows has become a regular affair. According to Nagji Desai, president of Maaldhari Ekta Samiti, in the last one month eight vehicles loaded with beef have been seized by the police. He claimed that cow stealing was particularly rampant in areas like Ramol, Isanpur, Bapunagar and Shahpur. In a meeting with state DGP, on Monday, Desai had accused gangs from Juhapura, Bapunagar and Dani Limda of targeting cows roaming on city roads. Desai said cow trafficking and slaughtering is a lucrative business as the meat from a single cow fetches about Rs6000.He also said that inter-state gangs were involved in this business. Earlier on Wednesday, Shamlajee police had detained a truck carrying 167 cows and calves. The truck with a Madhya Pradesh registration number was trying to enter Gujarat during the night.According to Shamlajee police, the 10 wheeled truck was jam packed with cows. Due to congestion, 66 cows and calves died. Earlier, following a representation by the Maaldhari community, Chitranjan Singh, state Director General of Police (DGP) had asked the concerned heads of police stations to curb the menace. "We are working towards curbing the menace. We will also ensure that the offenders do not get bail easily," said Singh. He also ordered that more vehicles be hired for patrolling in the night.